Photography by my bestie, Rachel Brooks . You guys already know how much I love my coffee, and because it's a daily ritual of mine I tend to go on a lot of coffee dates. These photos were taken by Rachel from 5 o'clock Sunday, aka my bestie behind the camera most days. We were on our way to As Quoted, one of our favorite local coffee shops in Pacific Heights. You can catch me there devouring a sweet Maca toast at least 1 to 2 days a week so come say hello! And I'll be honest, I'm usually running a bit behind when Rachel picks me up so anything easy, casual and comfy is my go-to. This outfit in particular is from my "Auntie's" shop. Honestly, there are times when a girl just does not want to squeeze herself into tight leggings and a crop top. That is why I was so drawn to this knit poncho and slouchy pant look. I was worried that these earthy neutrals wouldn't feel feminine enough on me so I added an unexpected pop of baby pink. And that pink bag that you are drooling over right now? It's the Blake Collection from Teddy Blake and carries just about anything you can think of. The reason I love this brand is because the quality is really high while the price is shockingly less expensive than those high end designer bags. When I compare it to some of my luxury handbags I truly can't tell which is higher end. I suppose that's the key to great design, right? 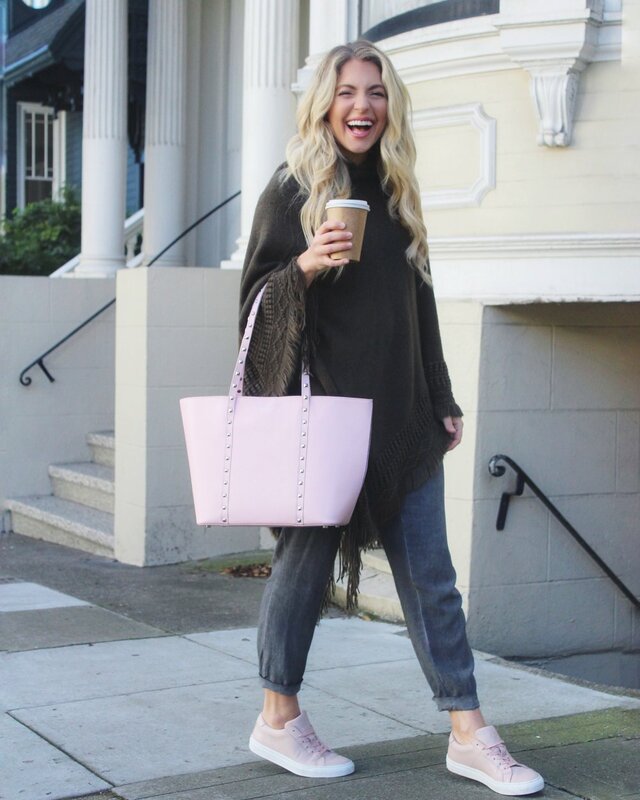 I also always try to buy bags in statement colors - like pink or blue - because it's an easy way to add interest to an otherwise neutral outfit but don't worry, this bag also comes in basic black. Oh and those shoes? Greats brand again, I wasn't kidding when I told you they were my new obsession.